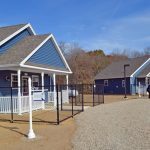 Welcome to Our Companion's Sanctuary, a place of care and healing for vulnerable dogs and cats. Our mission is to provide a place where dogs and cats who need special attention, whether due to medical or behavioral challenges, can have the time and the skilled guidance to recover from what they may have been through, have a calm and rewarding life while they are here, and make progress toward eventually finding that perfect forever home. Our staff and volunteers provide constant companionship and enrichment to make sure these needy pets stay happy and healthy. Our facilities are a real home for the dogs and cats, designed to give them the highest level of comfort and interaction. Our 47 acres of rural land provides the animals, the staff, and the volunteers with a pristine and serene environment in which to embark on this vital work. The Sanctuary is a place of true rest and recovery for these animals in need. How can I adopt an animal from the Sanctuary? Explore the Adoption sections of our website, where you can find photos of our adoptable animals and even apply to adopt one. We require an application process for adoption, which helps us to make the best possible match for your family and our animals. From there, you will have an opportunity to meet the pet(s) you are interested in adopting. We look forward to having you come to Ashford and meet our animals. Keep in mind that not all of the pets we have for adoption are living at the Sanctuary. By contacting our Helpline directly, or 860-242-9999 ext. 302 or online here, we can help you to navigate through the adoption process. Our cats and dogs come from a variety of situations, including municipal shelters (animal control) and local veterinary hospitals. 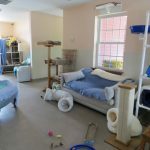 We typically assist with animals requiring special behavioral or medical care, those who may require longer term care than other facilities can provide. We also focus on pets who are homeless and have no other place to go, while awaiting adoption. Can I drop off an animal at the Sanctuary? We do not accept walk-in surrenders at the Sanctuary. If you have an animal you can no longer care for, please contact our Helpline so we can explain the various options available and assist you in the best possible way: (860) 242-9999, or contact us here. Do you take feral cats at your Sanctuary? We do not take feral cats at our Sanctuary, but have TNR programs and other resources to help feral cats in your community. We do not believe that housing feral cats indoors offers them the best quality of life possible and are not set up to do so. Our Companions is proud to have almost 400 volunteers. To learn how you can join these dedicated individuals by becoming an Our Companions volunteer, please visit our volunteer page. When can I come visit? 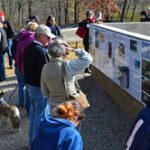 You can tour our Sanctuary and meet some of the pets every Saturday from 1 pm until 3 pm. When I visit, can I bring my own pets with me? Your pets would be most safe and comfortable at home, as we do not offer separate boarding space for visiting pets, and we are always concerned about the safety of leaving one's pets inside a vehicle. Why can’t I just stop by at anytime? The Sanctuary is the temporary home for many animals who come to us from a variety of situations, many of which were very stressful and unpleasant. A predictable schedule is key to providing the animals with a quiet, healing environment, and to provide the best overall care possible. We also want to make sure that our public hours are structured so that staff and volunteers can focus their time on caring for the animals and preparing them for their forever homes. Do you need supplies donated? Yes, we're always grateful for donations of needed supplies. 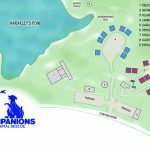 We have a list of supplies that we always need; also, we list specific items that you can order from Amazon.com, which will ship these items directly to Our Companions.